A computer virus infected a data terminal at Japan's space agency, causing a leak of potentially sensitive information, officials announced today (Jan. 13). The Japan Aerospace Exploration Agency (JAXA) discovered the malware Jan. 6 on a terminal used by one of its employees. A trace showed that the computer virus had gathered information from the machine, officials said. JAXA still isn't sure how the virus got on the computer, or who put it there. "Information stored in the computer as well as system information that is accessible by the employee have been leaking outside," JAXA said in a statement today. "We are now confirming the leaked information and investigating the cause." The employee in question works on JAXA's H-2 Transfer Vehicle, an unmanned vessel that ferries cargo to the International Space Station. Information about the robotic spacecraft and its operations may thus have been compromised, officials said, along with stored email addresses and system login information accessed from the infected computer. This same computer has had issues before. 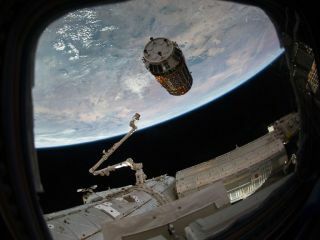 JAXA detected a different virus on the machine last August and removed the software. They kept monitoring the computer and noticed further anomalies, leading to the virus detection on Jan. 6. JAXA also has determined that the computer "sent out some information" sometime between July 6 and Aug.11 of 2011, officials said. The space agency is working to minimize the damage and prevent further incursions. "With the above backdrop, passwords for all accessible systems from the computer have been immediately changed in order to prevent any abuse of possibly leaked information, and we are currently investigating the scale of damage and the impact," JAXA said in the statement. "Also, all other computer terminals are being checked for virus infections." Computer viruses aren't just a problem on terra firma anymore. In 2008, a laptop used by astronauts aboard the International Space Station was found to be infected with a virus designed to swipe passwords from online gamers. That malware proved to be more of a mysterious nuisance than a real problem, NASA officials said.